Congratulations to "Julie G.", the winner in Angi's giveaway. Thank you to all who participated! It’s always great to be on JRS and with romantic suspense readers. I thought I’d share a little from book 2 of my West Texas Watchmen series that’s hitting shelves this week. 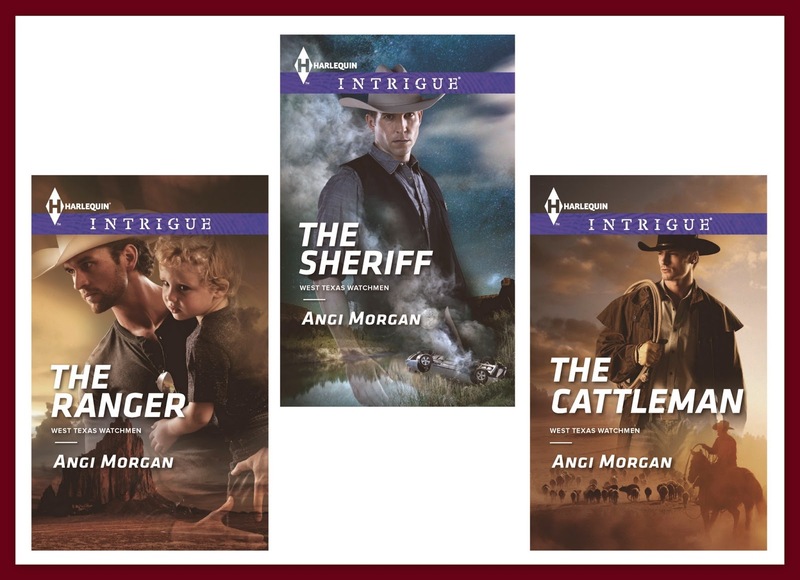 I’m so honored that Romantic Times Magazine chose THE CATTLEMAN as a Top Pick and gave it 4 1/2 stars. So to celebrate, leave a comment to be eligible for a $10.00 gift card. Nick didn’t have nearly enough ammo for a gunfight. Neither did Beth. As soon as she announced they were giving up, he turned off the satellite phone and shoved it in Beth’s pocket. “Cluing me in on your plans might be nice.” She stepped between the trees and around the large rock they’d grown around. “I’m supposed to be the big time DEA agent and Mr. Rancher over here is…” Beth mumbled as she led the way. Nick couldn’t hear much of her complaints but got the gist. They were more about being caught unprepared than about him trying to save their behinds. That was just fine. She skidded along, grabbing rocks to slow herself, mad at their situation but not whining about it. Maybe it was time to admit that he liked her more than just a little. But this was not the time or the place to admit it to her. A rock fell and hit his shoulder. On a normal day, it would take several hours to just walk down the road to the bottom of this mesa. Coming straight down the side was dangerous. Very dangerous. They moved in silence. Breathing hard. No time for water. Their legs working overtime battling the steep descent. Beth’s legs were already sore from riding yesterday. She skidded, let out an “oh no” and her hand landed in the middle of his back. He braced himself at her warning, catching a solid foothold and grip. “These boots were not made for climbing.” She brushed off the near fall with words, but she was stiff against the rock face. “You might lose one or two of those rhinestones,” he teased. “Better keep `em on.” He smiled and knew he needed to quit teasing. He should be serious. They were in deep trouble with no way out. An avalanche of emotion dropped on his head like the rocks above them could at any moment. Thinking about the woman instead of the problem was a sure sign he liked Beth…a lot. Maybe too much. Of course it was too much. He anchored himself and held out his hand, ready for her to come to him. She hesitated, barely raising her arm. He latched onto her fingers and her feet moved slowly. He waited. Bodies close together, eyes level with his and wide with curiosity. A ray of sun broke through the clouds and turned them several shades lighter. Men–bad men–were chasing them down a mountain. There was no place to hide. Nowhere to escape. What did he do? He kissed her. Not a good-bye. Not an invitation. Not just because she was close. His girl was in his arms and her lips were smooth against his parched ones. Their tongues did a short dance and he felt more confident. She restored something in him that had been missing the past year. He lifted his head, unable to help the smile that spread across his face. He expected a stern set down from her about how they were in a hurry. But, shoot, from the way she looked at him, maybe he’d given something back to her, too. “Moving. Right. You going to be okay?” he asked, really curious if the near fall had bothered her as much as the thought of losing her had bothered him. Choosing or creating a path where the javelinas didn’t traverse was hard enough without the added thoughts about Beth. He could hear the grumbles about being caught off guard, about not doing her job, not protecting her asset. And just like it had been scripted, he heard the lone shot of a gun and zipped back to the cliff wall, covering Beth’s body. “There’s something to be said about perfect timing.” Beth drew her handgun from its holster. Excerpt and Covers provided by Harlequin Enterprises. THE CATTLEMAN is a special story. Nick was named (not based) for my cousin’s son. He served in the military and does suffer from PTSD as many in the military do. Sometimes ordinary people also suffer from PTSD from a traumatic event. My heart goes out to them all. Nick is a returning character. He was originally in Protecting Their Child where he was shot. DO YOU enjoy reading the stories of returning secondary characters? Giveaway ends 11:59pm EST January 20th. Please supply your email in the post. You may use spaces or full text for security. (ex. jsmith at gmail dot com) If you do not wish to supply your email, or have trouble posting, please email maureen@justromanticsuspense.com with a subject title of JRS GIVEAWAY to be entered in the current giveaway. Love seeing you, too, Colleen. I'm really happy for my character, Nick. I hated to leave him hanging in Protecting Their Child. Oh Natalija...I want you to read Protecting Their Child first then. That is if you want to pick up THE CATTLEMAN. I feel the same way! I love it when authors bring back secondary characters so that they can get their HEA. I ahve several from other books...dying to tell their stories. Awesome! I love her books! I would be honored to own one of them too! Thanks Misty!! You made my day! Thanks Tammy. I love to write them !! And that review took my breath away. Great Sharon. Mine are definitely stand-alones. But if you read all of them...I think there's extra. Fingers crossed. Nice Martha. Thanks for stopping by. I really love seeing secondary characters returning as protagonists. It's one of my favorite things about the romance genre. This looks like a great read! Thanks Kay ! I hope it is ! Oh I really love when secondary characters get their stories told! It is so fun to revisit characters that feel like old friends. :) Great excerpt! Woo Hoo, Brooke. It was challenging having all four couples in the same scene. Very challenging. I love reading secondary characters with their own stories. They are memorable especially when they are the best friends of the main characters. I love reading stories featuring secondary characters! It's like revisiting the same world again. It was fun writing that world. I definitely knew what it looked like. Sometimes beloved secondary characters just beg for their story to be told. I just couldn't leave Nick hanging out there ... he had to get on the road to recovery. congrats to Angie on the new release! I also love when secondary characters get the spotlight! Thanks for sharing! If I am enjoying a secondary character I love following up with them. Sometimes I have to space my reading out, if I can't get the main characters out of my head, but I will always come back to a good author and a good cast. That's cool Amanda. A neat way of reading series.